Automated sprinklers cooled the incoming air and washed the smells from the early morning garden. As we awoke though, we knew instantly the day would be a scorcher. Even so we lingered in the house, talking gardens and eating a very leisurely breakfast. By the time we arrived at the first garden, it was almost noon. One of the distinct advantages to membership in NARGS is being in touch with fellow rock gardeners. No, I don't mean in your own neighborhood, though that is also a possibility. But when you arrive in a distant city, a quick glance at the membership list gives you the important names you want to know. Usually I will email those who have listed open gardens and set up a time to visit when I am in town. As a lurker on the rock garden internet forums, I have come to read the bi-lines of many of these expert gardeners. So I try to visit them also. The first visit of the day is to the garden of "Mr Penstemon". As I anticipated his garden is full of natives and other dryland plantings. 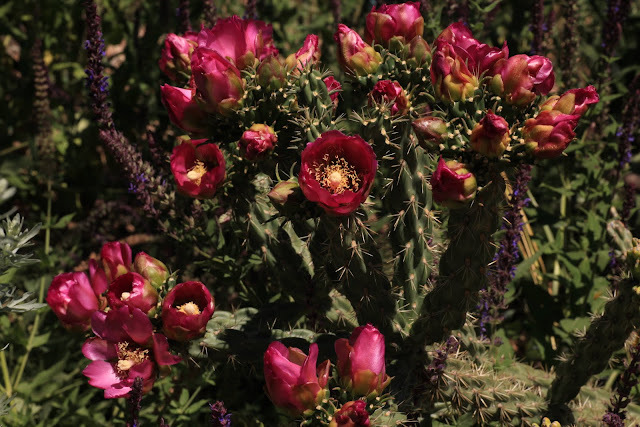 I was particularly taken by the blooming cholla. 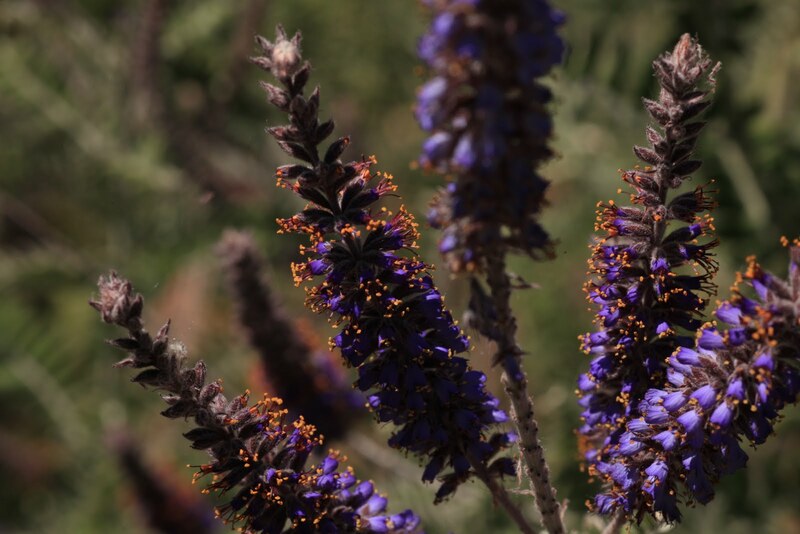 Upon closer inspection, I noticed spikes of purple intermingled. Over the weekend while still at home I had been weeding out errant agastache from the beds. Oh paranoia fulfilled, did it follow me here? But no, when I scoped out the leaves of the plant, they were bipinnate - pea like - the Fabaceae! It's name was one of my first questions of Bob. 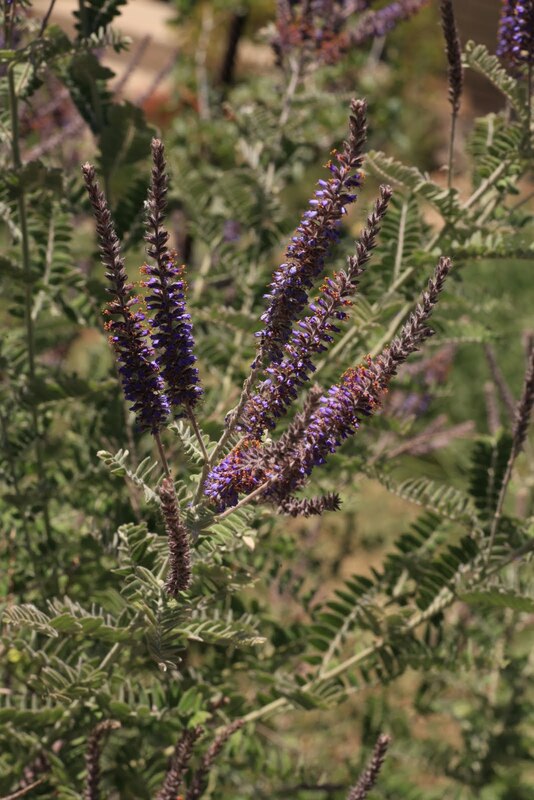 Turns out the leadplant is a native of Illinois and good for dryland planting. 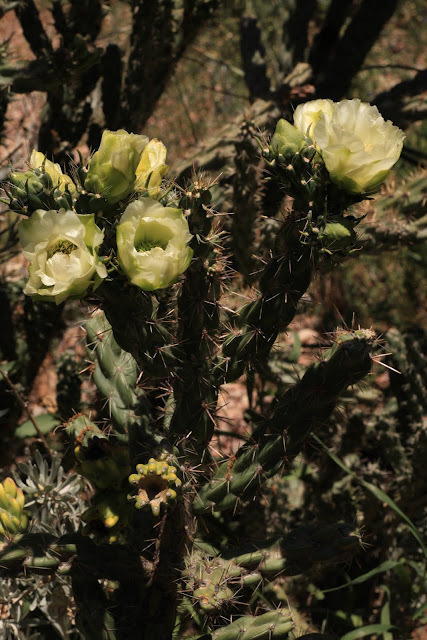 In back of the cylindropuntia (it was a little hidden and needed to be pointed out) was the white form of the species. Exclamation of lust! 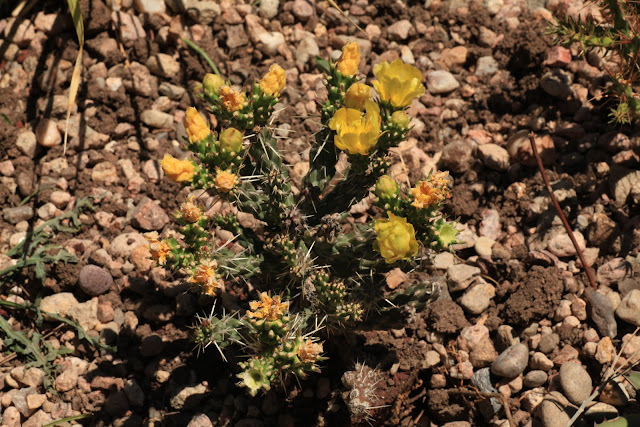 Bob also kindly instructed me on the "leaves" of cholla. But I was hesitant to touch them, not understanding when the thorns begin to form. 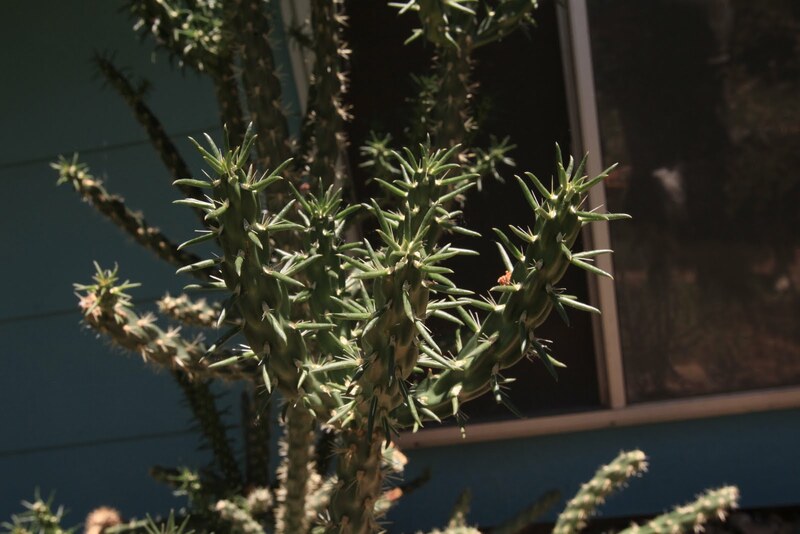 Cylindropuntias fascinate me. Maybe its because they are a thread from a dream lived long ago in the high deserts of California. Maybe because they are such a great architectural plant. Maybe because they are so difficult to get through a New England winter (black spots). Maybe because they are such a great plant. Bob's garden was full of new to me species. Of course there was another garden in back of the house. And what a garden it was - handcrafted through and through. What amazed me most was the range of plants grown in this garden, from fists of Physoplexis comosa to mounds of Primula marginata 'Linda Pope'. There were troughs full. And then there stood the garden ornament - wooden structures with haiku inscriptions, all lovingly crafted. The garden ambled and circled seemingly in a large embrace.